Continued innovations in semiconductor processes and RF packaging technologies have completely changed the ways engineers design RF, microwave and millimeter wave design applications. The technical and design support needs of RF designers are more specific and advanced than ever before. The design technologies continue to evolve and the nature of RF and microwave components will be a lot different in the near future. This article describes different types of mixers, their advantages and disadvantages and their evolving application in different markets. It discusses the changing landscape for frequency mixing components, primarily mixers, and how the advances in technology are changing the needs of different market segments. In RF and microwave designs, frequency mixing is one of the most critical sections of the signal chain. In the past, many applications were limited by the performance of a mixer. The frequency range, conversion loss and linearity of the mixer defined whether a mixer could be used for the application or not. Designs for frequencies above 30 GHz were difficult and packaging the devices at those frequencies was even harder. Most of the time, simple single, double and triple balanced mixers addressed the needs of the general market. But, as companies developed more advanced applications and desired to improve every dB of performance, traditional mixers just did not make the cut. The market today, and in future, needs frequency mixing solutions that are specifically suited for each application, optimized for performance, and support the common platform based designs that can be reused time and again. Depending on the type of application and end market, designers today have very different needs. In general, most designers now want wideband performance, increased linearity, higher integration with other components in the signal chain and lower power consumption. But, depending on the market segments, the priority placed on each of these criteria is quite different. Before we discuss the application of mixers and frequency converters in different markets, it may be useful to understand the underlying characteristics of different types of mixers. As the name implies a mixer mixes two input signals to generate a sum or difference of their frequencies. When the mixer is used to generate a higher output frequency than the input signal (by adding two frequencies) it is called upconversion. And when the mixer is used to generate a lower output frequency than the input signal, it is referred to as a downconversion. The below section explains the high level design and pros and cons of commonly used types of mixers. The most common type of mixers are passive mixers. These mixers come in different design styles, such as single ended, single balanced, double balanced or triple balanced. The most widely used architecture is the double balanced mixer. This mixer is popular as it provides good performance, offers a simple implementation and architecture, and is a cost effective design choice with a variety of available options. Passive mixers are usually known for their simplicity as they do not require any external DC (Direct Current) power or special settings. These mixers are also known for their wide bandwidth performance, good dynamic range, low Noise Figure (NF) and good isolation between the ports. The design of these mixers and their advantage of no DC external power requirements benefit them by providing a low NF at the mixer output. A good rule of thumb is that the NF in a passive mixer is equal to its conversion loss. These mixers work well for applications with low NF system requirements that active mixers cannot provide. Another area in which these mixers excel is in high frequency and wide bandwidth designs. They can provide good performance across frequency ranges from RF all the way up to millimeter wave frequencies. Another critical mixer spec is the isolation between different ports. This spec often drives the kind of mixer that can be used for the application. The triple balanced passive mixers usually provide the best isolation, but offer a complex architecture and are limited in other specifications such as linearity. The double balanced passive mixer provides good isolation between ports while offering a simpler architecture. The double balanced mixer offering an optimum mix of isolation, linearity and noise figure for most applications. From an overall signal chain standpoint, linearity (also commonly measured as IIP3; third order interception point) is one of the most important specs in RF and microwave designs. Passive mixers are usually known for their high linearity performance. Unfortunately, in order to get optimum performance, passive mixers require high LO input power. Most passive mixers use diodes or FET transistors and need about 13 dBm to 20 dBm of LO drive, which can be quite high for some use cases. High LO drive requirement is one of the key weaknesses of passive mixers. Another weakness associated with the passive mixers is the conversion loss at the mixer output. These mixers are passive elements with no gain blocks; as a result, the mixer output tends to have a high signal loss. For example, if the input power to the mixer is 0 dBm and the mixer has a conversion loss of 9 dB, the output of the mixer will be -9 dBm. Overall, these mixers are a very good fit for test and measurement and military markets, which will be discussed later in this article. The IQ mixer is a type of passive mixer. It offers the same advantages as regular passive mixers, plus the additional advantage of eliminating unwanted image signals without any external filtering. These mixers are also referred to as IRM (Image-Rejection Mixers) when used as a downconverter and SSB (Single Sideband mixer) when used as an upconverter. The IQ mixer is built from two double balanced mixers, and a LO signal that is split into two and then phase shifted 90 degrees apart (0° to one mixer and 90° to the second mixer). This shift in phase allows the mixer to generate only one sideband (desired) signal and reject the unwanted signal. The spectrum chart in Figure 2 shows the performance of an IQ mixer (purple line) and double balanced mixer (blue line) on the same chart. As one can see, the IQ mixer rejects the unwanted lower sideband, by offering a 45 dB rejection, compared to a double balanced mixer that produces both upper and lower sideband. As with the double balanced passive mixers, IQ mixers also require high LO input power. Architecturally, since the IQ mixers utilize two double balanced mixers, they tend to require ~3 dB additional LO drive versus the two double balanced mixers. IQ mixers are sensitive to well-balanced phase and amplitude input match. Any phase shift from 90° or amplitude imbalance in the input signal, hybrid, system board or the mixer itself directly affects the image suppression level. The effect of these errors can be corrected externally by calibrating the mixer to improve performance. Because of the sideband rejection characteristics, IQ mixers are commonly used in applications that need to remove the sideband without external filtering, while ensuring very good NF and linearity. Microwave point-to-point backhaul communications, test and measurements instrumentation, and military end uses are common examples of such markets. Another common mixer is the active mixer. There are two main types of active mixers: single balanced and double balanced (also referred to as Gilbert Cell) mixers. Active mixers have the advantage of an internal gain block at the LO port as well as at the RF output. These mixers provide some conversion gain to the output signal as well as benefit with a lower input LO power requirement. The typical LO input power in an active mixer is around 0 dBm, much lower than most passive mixers. Often, active mixers also include an integrated LO multiplier to multiply the LO frequency to a higher frequency. This multiplier offers a major advantage to customers by eliminating the need for a high LO frequency to drive the mixer. Active mixers usually have good isolation between the ports, however they suffer from a higher NF and, in most cases, lower linearity. 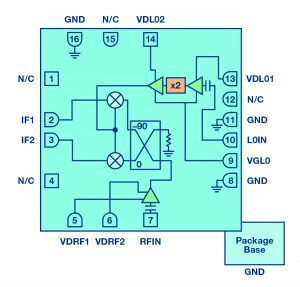 The need for input DC power affects the NF and linearity performance of the device. The active mixer can typically be found in communications and military markets, where low LO drive and the need for integrated conversion gain can be important. In test and measurement markets, active mixers are mostly used as 3rd or final stage mixers in the IF subsection or for low tier instruments where integrated and cost effective design is more important than best-in-class NF. As customers expect more complete signal chain solutions, another category of mixers that has become popular is the integrated frequency converters. These devices are built from different functional blocks connected together to create a subsystem that makes the customer’s end-system design easier. These devices integrate different blocks such as mixers, PLLs (Phase Lock Loop), VCOs (Voltage Control Oscillator), multipliers, gain blocks, detectors and more in the same package or chip. These devices can be built as a SIP (system in package) which assembles multiple dies in the same package or on one die that includes all the design blocks. 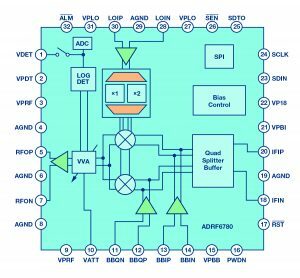 By integrating multiple parts into one chip or package, frequency converters offer significant advantages to designers such as reduced size, fewer parts, simpler design architecture and most importantly, quicker time to market. Now that we understand different types of commonly used mixer types and their pros and cons, we can discuss their application in different kinds of markets. For the cellular base station and repeater market, cost and integration are the biggest drivers. With the rapid growth of 3G, LTE and TDD-LTE networks worldwide, carriers need to develop RF hardware platforms that they can reuse across geographic markets utilizing different frequency channels. The needs of each geographic market are technically and financially different. As a result, mixers for cellular base stations need to be able to cover multiple cellular bands, meet the low price points for mass deployment and offer higher integration for quick development and low cost. Therefore, wideband, active and highly integrated mixers (frequency converters) are commonly used in this market. Analog Devices SiGe based BiCMOS mixers with integrated LO and IF amplifier and integrated PLL/VCO are commonly used by tier 1, 2 and cellular base station providers. The ADRF6655 (0.1 – 2.5 GHz broadband mixer w/ integrated PLL/VCO), AD8342 (LF – 3 GHz broadband active mixer), and the AD5811 (0.7 – 2.8 GHz mixer w/ IF and wideband LO amp) are commonly used mixers for cellular base station and receiver designs. Utilizing a mix of active and passive mixer technology, these mixers integrate multiple RF components at a low cost, while providing broadband performance. Infrastructure communications (wired and wireless) manufacturers are moving towards more integrated designs, but with key focus on high performance to support highest modulation for data throughputs. With the need to support increased data, backhaul radios have very high performance requirements. A decade or two ago, most OEMs (original equipment manufacturer) used balanced mixers and a heterodyne architecture, and a generic mixer served well across multiple point to point radio designs. The OEMs then started to utilize I/Q (or IRM) mixers for improved performance and to reduce filtering circuitry. As we saw above, I/Q mixer inherently removes the image frequency, thereby eliminating the need for expensive filtering for unwanted sidebands. Analog Devices offers a wide range of I/Q mixers covering all commercial microwave frequency bands. These mixers greatly simplify the base station design and significantly improve the performance that supported higher QAMs. But now, with the growing need for shorter time to market and further improvement to point to point backhaul performance requirements, OEMs have started to adopt more integrated I/Q upconverters and downconverters. A typical upconverter from Analog Devices (such as the HMC7911LP5E and HMC7912LP5E) integrates an I/Q mixer, a x2 active multiplier and a driver amplifier at the RF output in the same package. So instead of selecting multiple matching components and optimizing performance for each one of those, designers can now select a single upconverter and focus more time on optimizing the overall performance of the signal chain. Similarly, an I/Q downconverter from Analog Devices (such as the HMC1113LP5E, HMC977LP4E and HMC6147ALC5A) integrates an I/Q mixer, an LNA, an x2 active multiplier and an LO amplifier in the same package. With image rejection as high as 40 dBc across the band and noise floor as low as 2.5 dB, ADI’s downconverters offer industry leading performance for all commercial microwave backhaul receiver designs. Analog Devices is the only company in the industry that offers a complete portfolio of up–and downconverters for every commercial microwave band between 6 GHz and 42 GHz. The competition for performance and integration in the microwave backhaul radio market is intense. 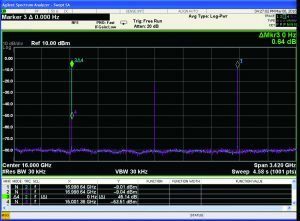 A few years ago, most OEMs focused on certain specific frequency bands and geared their solutions only to those bands. Today, with demand for global wireless growth and the the availability of new spectrum worldwide, most OEMs plan to develop radios for all commercial microwave radio bands between 6-42 GHz. As a result, base station designs no longer rely on discrete or partially integrated components. The new designs require a platform approach that allows common components to be leveraged across multiple frequency bands. As a result, most OEMs now expect one common frequency mixing platform to cover multiple radio bands and providing the best performance and economies of scale. Analog Devices’ industry-leading ADRF6780 (6 GHz to 24 GHz I/Q modulator) is a step in this direction. Using a single I/Q modulator OEMs can now design the entire up-conversion portion of the microwave backhaul radios for nine different radio bands between 6 and 24 GHz. As shown in Figure 4, the ADRF6780 integrate an I/Q mixer, selectable LO multiplier, a VVA, a log detector and an SPI programmable quad split buffer in the same package. This device offers OEMs the flexibility to either use it in traditional heterodyne architectures with IF of 0.8–3.5 GHz and eliminate individual components or in a direct conversion (zero IF architecture) that goes all the way from baseband all the way up to RF with just one part. The integrated LO doubler and buffer reduces the need for high input frequency and power. The device also includes VVA gain control to provide a constant output gain when needed. All the functionality in the part related to gain settings, sideband rejection, calibration, etc., can be controlled by the SPI and makes the user control easy to use. Figure 5 shows calibrated sideband rejection for the ADRF6780 and highlights, that even with wideband performance, this new generation of device offers state-of-the-art RF performance. This new converter redefines the way designers can approach signal chain design for microwave base stations. With this converter, RF designers can now spend more time optimizing the performance of the signal chain by doing software upgrades as compared to the traditional approach of matching each component just to achieve basic system specs. The test and measurement (T&M) instrumentation and military markets have always had a very distinct need for wideband performance. Most applications in these markets, such as electronic warfare, radar, spectrum analyzer etc., are highly customized and require extremely good signal integrity and accuracy. These applications usually also span across a wide spectrum of frequency bands (wideband requirement) and need the ability to detect very low fidelity signals (low noise figure and high linearity). Duncan Bosworth, marketing director for ADI, published a detailed article, (http://bit.ly/2aHAz1b) in June 2015 which discusses the wideband needs of military customers. As a result of the need for wideband, design flexibility and high performance, T&M and military companies prefer to use discrete mixers that can be individually customized and optimized to achieve specific design goals. As described above, passive mixers usually offer much better linearity and noise figure than integrated or active mixers. Incidentally, even within passive mixers, wideband and optimum RF performance (linearity, noise figure, spurs, etc.) are like two opposite sides of a coin. Traditionally, semiconductor companies have traded wideband for RF performance or the other way around. As a result, military and T&M designers would use multiple narrowband parts in parallel to cover wide frequency ranges. That way they were able to provide the best performance in each narrow band. Such a solution worked but made the designs extremely complex, expensive and difficult to maintain. With the improvements in technology and processes, companies like Analog Devices have now simplified the designs. 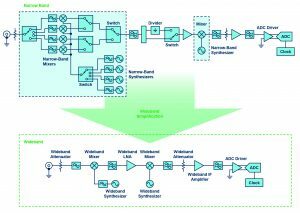 Using wideband mixer parts, T&M and military customers can get equivalent or better performance than narrowband parts, while also covering multiple frequency bands with one part. Since 2009 ,Analog Devices has featured the industry’s broadest portfolio of passive wideband mixers—single, double and triple balanced mixers, I/Q mixers, high IP3 and sub-harmonic mixers. Customers no longer have to compromise performance for wideband design. Chandra Gupta, director of business development at ADI, recently published a detailed article entitled “Investigate Wideband Frequency Converters” that discusses how Analog Devices is simplify-ing the T&M and military designs using wideband frequency converters (http://bit.ly/2bZFVbu). Figure 6 highlights how wideband parts (including wideband mixers) simplify the overall signal chain in T&M and military applications. Even though most other market segments have started to move towards integrated mixers to reduce cost and simplify designs, discrete mixing components such as the HMC773ALC3B (6–26 GHz double balanced mixer) and HMC1048LC3B (2–18 GHz double balanced mixers) hold a prominent place for T&M and military customers. For high precision test and measurement instrumentation applications such as spectrum analyzers and signal analyzers, and for advanced radar and electronic warfare applications, I/Q mixers have started to gain popularity. These mixers eliminate the need for external filtering, while still providing good image rejection. In the past, the majority of I/Q mixers in the industry were narrowband limited. 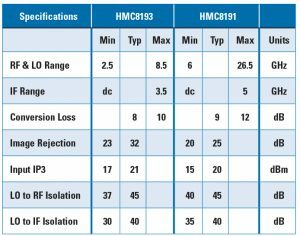 But now with Analog Devices pushing the limits of RF and microwave innovation, the industry can now expect two new wideband I/Q mixers – HMC8191LC4 (6 – 26 GHz I/Q mixer), and HMC8193LC4 (2.5 – 8.5 GHz I/Q mixer). With these two mixers, T&M and military customers can replace up to eight narrowband I/Q mixers and still achieve the same design goals for their application. Designers no longer have to give up performance for wideband performance. The T&M and military segments will likely continue to use discrete frequency mixing solutions for the next several years. However, with the need for more portable and lower power consuming applications, we may soon start to see a growing demand for increased integration and reduced power. Passive mixers by default offer much better linearity, noise figure and power consumption but offer limited integration flexibility. Similarly, active mixers offer high integration but at a tradeoff of power and NF. We expect more innovations and advanced developments in this direction. Maybe one day we will see frequency mixers that can provide the best of both worlds and offer high linearity, wideband performance, lower power consumption and reduced size. That day is not too far away. The microwave industry has continued to surprise the engineering community with its advances in technology. The needs of the microwave mixing components have now become more diverse and specific to market applications than ever before. The generic mixer offerings of yesterday will not work for the new applications across different market segments. OEMs are looking at their designs in a more platform– and–application centric way. The semiconductor players need to be able to provide frequency mixing solutions for each of these market segments. OEMs need to start working closely with semiconductor industry pioneers such as Analog Devices to develop frequency mixing solutions, not just frequency mixing components. Table 1: The advanced new packages now allow mixers even above 26.5 GHz to be offered in surface mount (SMT) packages, thereby easing the test and assembly of the applications.